This spot in front of city hall is a common site for protests. February 04, 2010 5:16 a.m.
City administration was ordered back to the drawing board for the second time after city aldermen rejected a proposed bylaw yesterday that would limit protests on the plaza or city hall sidewalks. Ward 12 Ald. 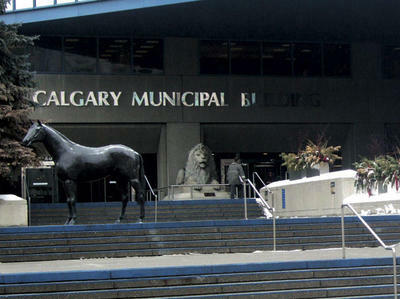 Ric McIver said a proposed bylaw that would have created a “permit zone” if people applied five days in advance was still an infringement of Calgarians’ rights. Richard Mann said he follows the Street Church Ministry, the leader of which is Art Pawlowski, and hopes their freedom of speech is not taken from them. “I think it’s a public street and we as taxpayers should have these basic rights afforded to us,” he said.